“Success is a process, a journey, during which stones will be hurled at you. You will have to catch those stones and convert them to “milestones “. The dawn of 12th June 2018, brought cheers to the hundred odd Zoom family as the company embarked upon their biggest milestone, which would be taken pride of, always. 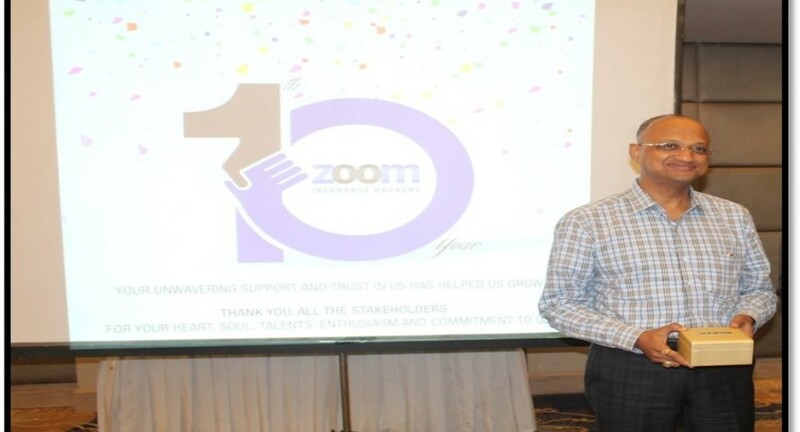 Zoom family came together to commemorate and celebrate the completion of a decade of success, a milestone of immense importance, on the evening of 20th July 2018. The gloomy weather outside notwithstanding, the large turnout of the smiling faces matched the enthusiasm in which Zoom had climbed the ladder of success, step by step, during this decade. Since the time Zoom took its first baby step on 12th June 2008, the company has not only grown in stature but also inculcated a culture and attracted a pool of talent, which today the industry and competitors gaze at in awe and despair. Mr. Prashant Gupta, Managing Director of Zoom and the man behind this empire, in his keynote address endorsed this aspect as he took us all through the memorable journey. The audience was left spellbound as he traversed down the memory lane proudly exhibiting the fact that the empire of today had actually started with three persons, with a thirty-three-year-old youngster at the helm of affairs. A peep at the record books of the Indian insurance industry might glorify the fact that Prashant could possibly be one of the youngest to start an insurance broking firm. Be it the regulator or the esteemed customers, Zoom has drawn accolades at every stage. The transparency, honesty and the zeal to serve have been lauded and raved over by the insurers and the customers alike. The technical prowess coupled with the sales acumen has left many clients mesmerized. This has been exemplified by the growing number of client base every year. “To excel in the corporate world, one has to win the hearts of the employees at the workplace”... Over the years, Zoom has practiced this with astounding success. The result is that excellence has become not an act, but a habit. Notwithstanding the craving competitors trying to attract talents at every stage, Zoom has been able to retain the best over years and some since inception ...a statistics which is gratifying and satisfying. A citation proclaiming the company as one of the “top employers “of Gurugram is a testimony to the attempt in the area of employee engagement. Milestones are indicators of many more such landmarks, yet to be achieved. The vision and mission of Zoom are to strive to work hard, look ahead and march on till the zenith of success is reached. Certainly, Zoom has promised to keep and miles to go before it sleeps.